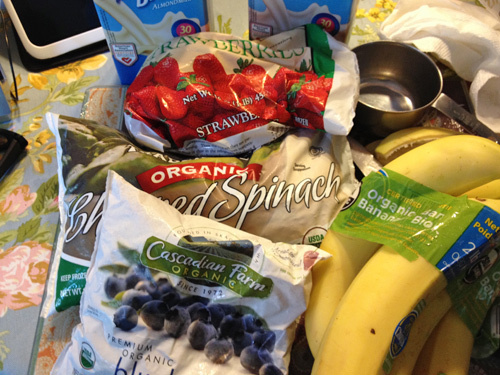 Last summer my friend Tamiko inspired me to start drinking smoothies. She recommended a book and there began a love affair between me, my blender and all the veggies I could find. I drank smoothies in the past but they were only fruit based. So I started making green smoothies for Leao and I everyday. Many days we had one in the morning and one in the afternoon. We did this pretty consistently this year but my recent anniversary trip with Leao (pictures to come soon), reigniited my desire to incorporate even more smoothies. I went to a place on Martha’s Vineyard who incorporated all organic ingredients in their smoothies and I knew I had been missing out on many fruits. 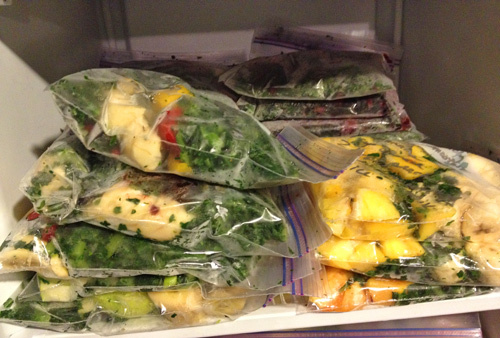 So I went on Pinterest and found a great link to a site that this lady that filled a bunch of freezer bags with a bunch of smoothies for quick access later. I loved the idea so I ran out to Trader Joes and picked up all my ingredients and freezer bags. The good thing is that many of the ingredients is used in each smoothie so I didn’t have to buy a whole bunch of different things. 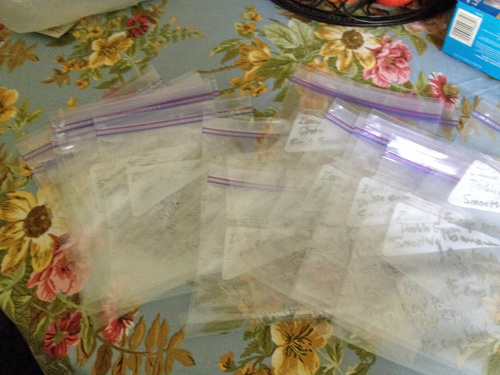 The next thing I did was write the name and recipe of the smoothie on each bag. Now I do admit this takes a bit of time. I ended up making a batch of 18 smoothies. But the reason you write the recipe on each is so that you know what final thing to add when you throw it in the blender. Because almond milk, flaxseed, almond butter and ice are the only ingredients I held off until time to make the smoothies. So next time I might just write the name of the smoothie on each bag and then type up a master list of the recipes to look up what I need to add. Now I have 18 smoothies sitting in the freezer that Leao and I can drop into the blender and in minutes have a yummy smoothie and they are all under 200 calories. One thing I have enjoyed in this year of my smoothie journey is I enjoy looking at all the fruits and vegetables before they go into the blender and think how hard it would be to eat all those vegetables and fruits in a day. But the magic happens in the blender and they go down so nice. It’s the guaranteed thing I do for myself daily. 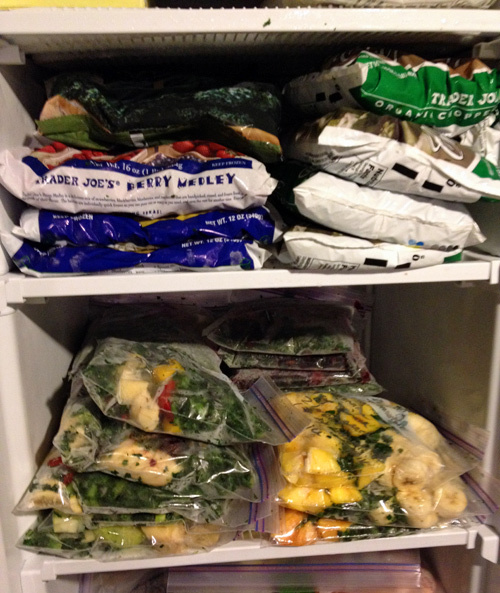 I think having quick access to variety will help me continue to maintain daily smoothies for Leao and I.
I keep going to look at them in the freezer. I am going to find a good day of the week to regularly make my batches. The best part is they are so inexpensive when you make them like this. So please check out this site, All thing Katie Marie and see if you might want to give it a try. You will be happy you did. Previous PostMy June 2014 kit from Cocoa Daisy.